#physicalthursday Easy Ways To Burn Calories! It’s a busy world, is it not? We hardly have time to relax as it is. How on earth are we suppose to get any activity in? Let’s just say it may be a little easier than you think. 1. Time management – Remember, you are your own worst enemy when it comes to time. Besides work schedules, you hold the clock in your hands. Develop the discipline to add a workout to your daily routine. If you can squeeze in 20-30 minutes somewhere, it will help you in the long haul! 2. More steps – Try taking the longer way to your desk. Try power walking on your lunch break. Try walking fast to the bathroom. You can find new ways to take more steps, and even faster steps to burn more calories. 3. 1 minute of power – Do one minute of any type of activity several times during the day. Squats, wall-sit, jumping jacks, stairs, running in place, high knees, etc. 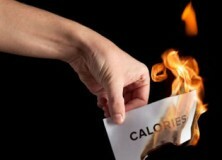 Do this 3-5x per day to help burn an extra 30-50 calories in your day! 4. Skip the T.V. – Why waste more prescious time out of your life? Take 30 minutes off of your video game/computer/T.V. time. It will help you get moving. If you have a treadmill or some other type of equipment in your house, why not do that while watching T.V.? Those are 4 ways things that I do to get moving. Do you have any extra tips? Why not comment them below?